4K Lodges is located in the rustic little town of Poth, Tx just 40 minutes from San Antonio. Motel guests will have easy access to local area shops, church halls, event centers, and the Eagle Ford Shale oil and gas area. 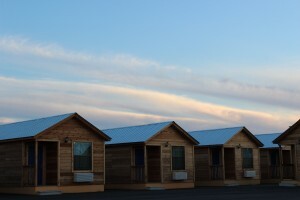 For your convenience, each cabin at the 4K Lodges comes with two comfortable queen size beds, a full size refrigerator, microwave, cook top, coffee maker, free high speed wireless internet, and Direct TV. All cabins are fully equipped with pots and pans, dishware, and utensils. A laundry mat and ice machine are located on the premises. Copyright 4KLodges Inc.© 2013. All Rights Reserved.